All images are for illustration only. Find out where you stand and be prepared for what's next with easy access to your FICO® Score through Wells Fargo Online®. Accessing your FICO® Score through this program will not impact your credit score. Eligible Wells Fargo customers – on your desktop or tablet, sign on to your account and select View Your FICO® Credit Score from the Planning and Tools section of your Account Summary. On a smartphone, select View your FICO® Credit Score at the bottom of your Account Summary. Note: The FICO® Score presented is for educational purposes and may differ from the scores that lenders use to make underwriting decisions. When applying for a new account at Wells Fargo, a unique scoring model is used which considers more than credit scores to evaluate applications. Remember: Accessing your FICO Score is free and will not impact your credit score. Why is Wells Fargo providing a FICO® Score? Wells Fargo is providing you with your FICO® 9 Score which is the newest version available. It can be used for educational purposes and as a benefit to support your awareness and understanding of FICO® credit scores and how they may influence your future. This score is provided through Wells Fargo Online® at no additional cost beyond your standard internet/mobile carrier fees. How will I know if my FICO Score® is available? If your account is eligible, the link to View Your FICO Credit Score will automatically display on your Account Summary screen. Just tap to opt in and view your FICO® Score. Note: You can also access your FICO® Score in Spanish with your smartphone. 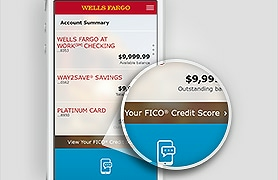 Direct your mobile browser to wellsfargo.com or download the Wells Fargo Mobile® app. Sign on to your account; go to mobile settings and select your language preference. I opted in, but it says, "No score is available." Why? The credit bureau wasn’t able to completely match your identity to your Wells Fargo Online® information. To keep your information current, sign on to your account, from the Main menu, select Security & Support, Protect Your Accounts, and go to Update Contact Information. From the Wells Fargo Mobile app, sign on to your account, go to the main menu, select Manage Your Profile and go to Update Contact Information. If you've frozen your credit with the credit bureau, you may not immediately receive a credit score. A score should become available for you to view after the next monthly update. Contact Experian with further questions. What if the View Your FICO® Credit Score link does not appear? This feature is available for Wells Fargo customers enrolled in Wells Fargo Online with a consumer product. *Windows phones can access FICO Score®only from the mobile website. If you don’t see the link and feel you should be seeing your FICO® Score, call us at 1-855-329-9605, Mon - Fri 7:00 a.m. – 7:00 p.m. Central Time, Sat 8:00 a.m. – 4:30 p.m. Central Time. Why can I see my FICO® Score, but others on my account can’t see theirs? What if I don’t want to see my FICO® Score on a continuous basis after I opted in for it? You can choose to opt out of seeing your score at any time. Keep in mind, you will lose your score history after 120 days if you choose to opt out. As long as you are eligible to view your FICO® Score, you will always have the ability to opt back in. Where is Wells Fargo getting this score? We will obtain your FICO® Score from Experian, a consumer reporting agency. The score provided under this service is intended for educational purposes. The FICO® Score reflects a general snapshot of your credit profile at a specific point in time and can vary month-to-month. Obtaining your FICO® Score results in a "soft inquiry" and does not affect your credit score. Is the FICO® Score I’m seeing the same score Wells Fargo uses when I apply for a new account? No. Your FICO® Score and the associated educational content are provided for your own non-commercial, personal educational review, use, and benefit. Keep in mind that the FICO® Score presented is for educational purposes and may differ from the scores that lenders use to make underwriting decisions. When applying for a new account at Wells Fargo, a unique scoring model is used which considers more than credit scores to evaluate applications. How often will my score update? FICO® Scores in this program will update monthly. You can expect your new score to arrive on or around the 5th business day of each month. Please note that scores reflect data from your credit file at the time it was calculated and may be from a previous period. FICO® Scores are the most widely used credit scores and are used in over 90% of U.S. lending decisions. Your FICO® Scores (you have more than one) are based on the data generated from your credit reports at the three major credit bureaus, Experian®, TransUnion® and Equifax®. Each of your FICO® Scores is a three-digit number summarizing your credit risk, that is, presumably how likely you are to pay back your credit obligations as agreed. What it the best credit score? Most credit scoring models follow a credit score range of 300 to 850 with that 850 being the “best” score you can have. However, there can be other ranges for different models, some of which are customized for a particular industry (credit card, auto lending, or insurance for example). While the majority follow the 300 to 850 range, there are outliers (Bankcard 2 Scores) that range from 250 to 900 and some VantageScore models use a scale range of 501 to 990. For more information on the different scoring models, view Understanding credit scores. Why are there different versions of FICO® Scores? Different lenders use different versions of FICO® Scores to help them consistently evaluate potential borrowers’ credit risk, which makes the lending process faster and fairer. It’s likely that your FICO® Score versions won’t all be the same. But since all FICO® Scores share a similar foundation, more often than not your FICO® Scores will be relatively similar. For more, see our article on Understanding Credit Scores. Why is this FICO® Score different than other scores I’ve seen? There are many different credit scores available to consumers and lenders. FICO® Scores are the credit scores used by most lenders, but different lenders (such as auto lenders and credit card lenders) may use different versions of FICO® Scores. In addition, your FICO® Score is based on credit file data from a particular credit bureau, so differences in your credit files may create differences in your FICO® Scores. The FICO® Scores that are being made available through Wells Fargo are for educational purposes. When reviewing a score, take note of the date, bureau credit file source, version, and range for that particular score. For more, see Understanding Credit Scores. Why do FICO® Scores fluctuate? There are many reasons why your score may change. FICO® Scores are calculated each time they are requested, taking into consideration the information that is in your credit file from a particular consumer reporting agency at that time. So, as the information in your credit file at that bureau changes, your FICO® Scores can also change. Review your key score factors, which explain what factors from your credit report most affected a score. Comparing key score factors from the two different time periods can help identify causes for changes in your score. Keep in mind that certain events such as late payments or bankruptcy can lower your FICO® Scores quickly. If I don’t agree with my FICO® Score or Score Factors, what should I do? Your FICO® Score and the Score Factors affecting your credit score were provided to Wells Fargo by Experian based on information within your credit report on the calculation date (“as of” date). If you feel this information is inaccurate, your next step should be to request a free credit report from AnnualCreditReport.com. If there’s incorrect information within any of your credit reports, follow each bureau’s instructions on how to dispute that information. If there’s incorrect information about your Wells Fargo accounts, please call the Wells Fargo phone number in your credit report. Can I expect the FICO® Score version I receive from Wells Fargo to change? FICO periodically updates its scoring models and Wells Fargo may choose to upgrade to a more updated score version. If this happens, we'll notify you when a change to the score version change occurs. You can locate the score version on your FICO® Score display. It is listed directly below the score and rating. Will accessing my FICO® Score from Wells Fargo negatively impact my credit report? No. You can check your score here as often as you want without negatively impacting your credit report. By federal law, you are entitled to one free credit report every 12 months from each credit reporting company, TransUnion®, Equifax®, and Experian®. Find them at AnnualCreditReport.com. Take advantage of this service annually to ensure the information on your credit report is current and accurate. A credit bureau, also known as a consumer reporting agency, collects and stores individual credit information and sells it for a fee to creditors so they can make decisions on granting loans and other credit activities. Typical clients include banks, mortgage lenders, and credit card issuers. The three largest credit bureaus in the U.S. are Equifax®, Experian®, and TransUnion®. Is there credit education or assistance available to me? 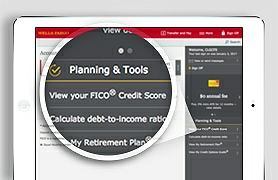 In addition to the customized Wells Fargo credit insights you receive with your FICO® Score, you can also access the Smarter Credit™ Center and many other resources on wellsfargo.com. Wells Fargo and Fair Isaac aren’t credit repair organizations as defined under federal and state law, including the Credit Repair Organizations Act. Wells Fargo and Fair Isaac don’t provide "credit repair" services or advice or assistance with "rebuilding" or "improving" your credit record, credit history, or credit rating.